Small stakes leave Spoon with the maximum blues. Backtracking: When you sit around pretending to study all day, there’s no time to appreciate the raw power of the guitar. Consequently, rhythm-based music has soundtracked much of the last five years of my life, with “rock” music relegated to weekend blowouts, when I just want to sit in front of the hi-fi, mouth agape at the rich overtones and natural harmonies of the humble axe. There have been guitars, of course, but they were either in the post-rock vein, or they were being re-appropriated into dance music. Like I wrote previously, the post-punk revival happened. In my downtime, the twin mainstays whose CDs always found their way into the stereo were Spoon and My Morning Jacket: two bands who keep the rock rolling. The former make taut, concise music that, at its most prosaic, resembles Pavement and Led Zeppelin, but, at its smartest, fashioned instantly familiar melodies out of white space and scrappy guitar. The latter write caterwauling, brawling songs, recorded in grain silos and made to be played in country discos, like the ones Dub Blood frequents in Annie Proulx‘s Postcards. I have written in the past about the minimalism of Spoon; how they rarely eke out a song beyond its natural limit. But they also do maximalism, of a kind, as on their 2007 album, Ga Ga Ga Ga Ga. Unexpectedly embracing a poppier tone (in particular, that of rhythm and blues), the band sound less jittery and paranoid than on their other albums, and the songs take in rousing brass and leather-jacket swagger. Experimental moments persist, notably with “The Ghost Of You Lingers” and its urgent keys and desolate vocals, but the prevailing mood is one of accessible optimism, even when the songs’ protagonists are deadbeats or world-weary. “The Underdog”, which was produced by Jon Brion (of Late Registration fame), hurtles out of the starting block before settling into a jaunty shuffle. Over scraggly acoustic guitars we hear frontman Britt Daniel revelling in the band’s titular status; a faintly mariachi brass arrangement likes to cut in periodically. At the song’s close, brass and percussion whip up a ragged storm, before the whole thing implodes in on itself, which could be seen as a metaphor for the impermanence of the band’s popularity. There are several references to Elvis Costello, circa-Get Happy! !, on the album. Most audibly, many of the songs bear a similar debt to the R&B and soul Costello was inspired by on his 1980 album. Additionally, a bonus disc supplied with some editions of Ga Ga Ga Ga Ga was entitled Get Nice!—if this is a coincidence, I’ll be damned. On this supplement, the band spell out the inner workings of the songs, and the processes by which they arrive at the final versions of songs. So we get a space-rock demo of “You Got Yr. Cherry Bomb”, only a fragment of which made it to the final cut, tacked on right at the end of the album version. Another song on the main disc which retains the stamp of a cut ‘n’ paste approach is the brash “Finer Feelings” (see above), which progresses in a familiar, canonical style (brittle guitars, intricate drums and percussion, the odd flourish of synth) until we get to where the bridge should be. Suddenly, the main arrangement peters out, to be replaced by an interpolation of Mikey Dread’s “Industrial Spy“. Distant samples of a cheering audience clash with it, creating a disorienting, dubby feel. And then, a few seconds later, the brittle guitar cuts back in and we are returned, safe and dry, to Spoonland. It’s this kind of abrupt yet comfortable experimentation that Spoon excel at weaving into what might otherwise be dubbed “dad rock”. My Morning Jacket reached the apex of their rural rock on 2003’s It Still Moves. A few of the songs, like “Dancefloors” and “Easy Morning Rebel”, encourage innocent jiving, and conjure up the aforementioned country discos, in which minor fights break out, and belles are courted. But there are also more spacious and elegant songs, like the centrepiece “I Will Sing You Songs” and the yearning “Rollin’ Back” (see above), which allow frontman Jim James room to breathe. He still uses his distinctive howl on these songs, but more sparingly, as an embellishment, in collaboration with an elegant croon and gentle cooing, the likes of which would later be resurrected by Robin Pecknold of Fleet Foxes. James’s voice is cloaked in reverb—not the pretentious kind used by the lo-fi crowd, but a more hushed variety which lingers in the air. Behind him, the instrumentation is less raucous, with muted chords and fragile arpeggios. It’s the kind of music that could soundtrack first dances in the backwoods of Kentucky, or Tennessee, in village halls and country clubs untouched by Jack Johnson and Snow Patrol. 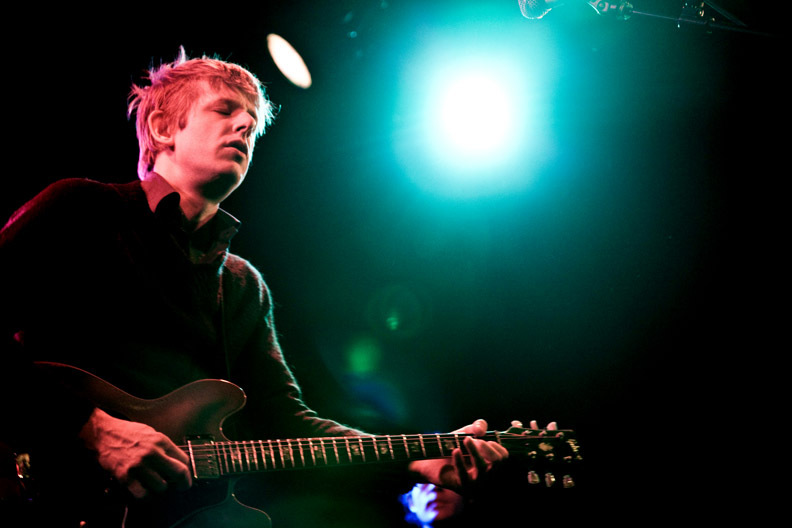 Spoon‘s 1997 EP was entitled Soft Effects; its opener, “Mountain To Sound”, was an almost robotic splurge of chunky guitar chords over a barren expanse of tape. Thirteen years on, Spoon trade in far subtler terms on record – the psychoanalytically titled Transference possesses compositions of nuanced yet ragged beauty, replete with lovingly painted washes of droning synths and bizarre vocal, yes, effects. Going in to my first Spoon gig, what I wanted to know was how this meticulously arranged chaos that the band have mastered in the studio plays out in a live setting, where everything is instantaneous and nothing can be rearranged or meddled with later on. Impressively, and perhaps this is a rationale for why so much of Transference stems from live demo tracks, the band pulls off the performance with passionate and anthemic aplomb. From the get go, they are unafraid of playing with our conceptions of how their songs, whether new or old, sound and develop. Opener “Don’t Make Me A Target” is suitably slow-building, rising to a brutal peak as frontman Britt Daniel conjures the same vocal trickery used in their newer material. Throughout the gig, two things remain constant: the entire band’s sonic tapestry-weaving, and drummer Jim Eno’s delightedly precise and virtuosic rhythms, which manage to fulfil the same manifesto as opening band White Rabbits’ arsenal of percussionsists with considerably more economy and considerably less showiness. A few songs later, when translating another Ga Ga Ga Ga Ga gem, “The Ghost Of You Lingers”, the band once again engage in direct combat with the material, with Britt Daniel’s characteristic gravelly bark gradually overwhelmed by feedback, reverb-drenched keyboards, and bliss-nearing slabs of white noise. From a band that usually trades in rock qua rock, in a minimalist style, this is an unexpected gesture that revels in their playful, emotionally raw experimental side. The setlist is culled almost exclusively from the band’s last four albums (alas, despite numerous calls from the crowd, “Fitted Shirt” is absent, along with anything else from Girls Can Tell and its predecessors), but to be honest, many of the songs are melded into the aesthetic favoured on recent release Transference – in particular, “My Mathematical Mind” and “They Never Got You” are subsumed into effects-heavy motorik grooves, much to their advantage. Britt Daniel looks like he’s having a riot of a time mucking around with his voice, and it’s just as well that the crowd adoringly lap up his playfulness. This is evidenced further by the band’s mesmerising cover of The Damned’s 1979 single, “Love Song”, which ditches the original’s clattering punk in favour of the same droney keyboards that underpin “Before Destruction”. Nevertheless, when it’s time to rock out, Spoon prove they’re no slouches, with “Rhthm & Soul” and “You Got Yr. Cherry Bomb” dispatched with great vigour and sparkle. Kill The Moonlight-era fare, meanwhile, is represented by the classic pairing of “Small Stakes” and “The Way We Get By”, and encore closer “Jonathan Fisk”, which is delivered with the maximum conveyance of end-of-tether anxiety. As I’ve mentioned on previous occasions, it’s a crying shame that Spoon aren’t bigger fish here in the UK – particularly telling is the fact that on the same night, on the other side of London, bright young things Vampire Weekend were busy playing to a sell-out crowd at Brixton Academy. On the other hand, it’s always a pleasure to see such masters of their art at close quarters, and in this respect, the Electric Ballroom can’t be beaten. Taken in combination with probably the best live mix/engineering I’ve witnessed at a gig (we can thank the perfectionist Jim Eno for that, I suspect, and not just because the drums were notably crisp), this was a really tremendous performance, with a set of songs cherrypicked from a career full of cult classics. Spoon rarely bring their concise breed of art rock to Britain; this was an unmissable opportunity to see them weave their magic over a rainy and miserable London. It was perhaps inevitable, given Spoon’s stubbornly indie ways, that their follow-up to follow 2007’s Ga Ga Ga Ga Ga is willfully ragged, challenging and melody-free. Transference is hardly a krautrock behemoth; nonetheless, from the first wavering organ drone of “Before Destruction”, over which Britt Daniel growls like a spectator to the end of days, to the atonal tape loops that cut through the closer, “Nobody Gets Me But You”, this is a deliberately difficult work. That’s not to say that Transference is a bad album – in fact, it’s a very good album. Self-produced, and often committed to tape from home recordings and demo tracks, the album veers between acoustic laments targeting primal emotions (“Goodnight Laura”, “Out Go The Lights”), and shuffling, dubby funk (“Who Makes Your Money”), in which Daniel’s sparse vocals are further obscured by the kind of playful production trickery the band has become known for. In-studio chatter is prevalent in the interstitial few seconds between tracks; on several occasions, songs either end abruptly, or suddenly isolate one instrument which peters out in a disconcerting fashion. It’s not all shunt and groove, luckily – that would have been somewhat monotonous and overly gloomy. Spoon may have pruned their brand of minimalist art pop down to the bare essentials, but they’re still apt to throw a wobbly now and again, as on the barreling, piano-thrashing R&B (in a fifties sense, not à la Beyoncé) of “Written In Reverse” which recalls the grander moments of Gimme Fiction, or indeed the scratchy lo-fi of “Trouble Comes Running”, where the drums and guitars are entirely panned to opposing channels in a defiantly Pavement-esque style reminiscent of 1998’s A Series of Sneaks. Some will argue that Spoon’s relentless infatuation with sparseness and economy has turned to parody on Transference. I would argue that the singleness of vision displayed on this album result in a subtle, vaguely creepy sense of cohesion that lend it an understated appeal that resembles a more low-key variant on the midnight ruminations of Spoon’s 2002 magnum opus, Kill The Moonlight. I wish I had grown up listening to Spoon. I’ve written on several occasions about the way their precision-engineered intelligent pop music gets to the point in just the right length of time, with witty, insightful and intellectualised lyrics coupled to hooks and grooves that are sparse, but catchy as anything. I defy anyone to listen to “I Turn My Camera On” or “Don’t You Evah” and not have their hips swinging within the first thirty seconds. And my, how they’ve grown. It’s startling to think that the same band that produced a work of such brooding melancholy as Kill The Moonlight has since gone on to create a sparkling gem of a pop song as The Underdog, laden with parping brass arranged by Jon Brion. Their 2007 LP, Ga Ga Ga Ga Ga, was a masterpiece of concision and emotion. In January, they will bestow upon their adoring fans a new creation, which will be called Transference – possibly in honour of the psychoanalytical phenomenon involving the unconscious redirection of emotion from person to person. In anticipation of this, Spoon have treated us to an early indulgence, in the form of a new single, entitled “Written In Reverse”, which hits digital retailers tomorrow, but can be streamed from NPR Music right now. Unsurprisingly, I’ve already given it a spin on your behalf. It’s an interesting beast, somehow more reminiscent of their Gimme Fiction-era work, riding in on parlour-room piano and an almost criminally lazy drum beat. The bass is throbbing and occasional; Britt Daniel’s vocals are sandpaper-hoarse and multi-tracked like a choir of Tom Waits clones. Unlike some of Ga Ga Ga Ga Ga‘s best surprises, there’s a return to the wandering, night-time feeling that characterised the two albums before it. 3 minutes and 20 seconds in, you think there might a dose of levity in a surprising chord change on the keys, but the respite is fleeting, instead leading into an exquisite interplay between piano triplets and gurning, insistent guitar moves. The protracted false ending could be another comedy gesture, were it not for the claustrophobia that envelops the actual ending. “Written In Reverse” is expansive and sophisticated, and certainly the song I predicted would follow sneak-preview single “Got Nuffin'”, released earlier on in the year in a three-song EP. That song had a quick-limbed motorik groove; this song is more lumbering and sleazy. Which is no bad thing, because no band this side of The National does reflected sleaze and grease better than Spoon – the way Britt Daniel can paint a character’s portrait is wonderfully enriching. It’s a grower of a track, then, and it wouldn’t surprise me if it ended up being etched into my brain before long, like so many of the band’s previous creative apogees. For sure, I expect Transference to be nothing short of a magnum opus.